Fresh concrete means the concrete which is just mixed and is about to place in the forms. Properties of fresh concrete controls long term behavior of the concrete. It is important to perform some tests on fresh concrete in order to have desired long term results. Properties of fresh concrete include workability, air content, temperature and setting time. Let us discuss these properties of fresh concrete and tests to performed on it. excessive bleeding or segregation of ingredients in the mix. Requirement of workability of concrete varies with type of element that is to be concreted. Highly workable mix is used in slender elements or elements with heavy reinforcement. However mass concrete doesn’t require much workable mix, like in foundations. Also it is requirement of concrete pump that concrete should be workable to flow freely from it as shown in the picture. Less workable concrete can cause choking of concrete pump. Workability of concrete can be enhanced using water but higher water to cement ratio reduces it strength. Therefore it is recommended to use admixtures (plasticizers, super plasticizers or water reducers) to increase workability of concrete. Slump test is used to measure workability of fresh concrete. Slump test is used to measure workability of fresh concrete. This test is done in field on fresh concrete before placing it in forms. In this method, fresh concrete is filled in a cone in three equal-volume layers and each layer is consolidated with rodding it 25 times with a tamping rod. The cone is then lifted up straight and the sag of the concrete is measured to nearest 1/4 inch from top of slump cone. Detail guidelines of slump test procedure can be found in ASTM C143/143M. Previously, Kelley ball test was also practiced to measure workability of fresh concrete (ASTM C360, ‘‘Ball Penetration in Freshly Mixed Hydraulic Cement Concrete’’). In this method the penetration of an object into a flat surface of fresh concrete is measured and related to slump. However this test was withdrawn from ASTM in 1999. There are two types of air content that can present in fresh concrete mix. These are entrapped air and entertained air. Entrapped air is small bubbles of air that are produced during mixing of the concrete. This type of air usually constitutes 1-2% of volume of concrete. Air content can be intentionally mix in concrete. This is done using special type of cement or some air entraining admixtures. 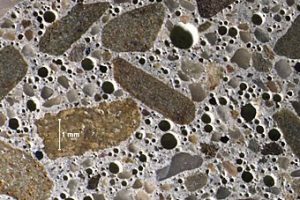 Adding air adds tiny air bubbles (as shown in picture) to the concrete mix which acts like a lubricant and increase workability. Air content also increase resistant of concrete against freeze and thaw. However large amounts of air can cause adverse effects to strength as density of concrete gets lower by adding air. A field test frequently required measures the air entrapped and entrained in fresh concrete. Various devices such as air meters are available which give quick and reliable results. In the basic methods, the volume of a sample is measured, then the air content is removed or reduced under pressure, and finally the remaining volume is measured. The difference between initial and final volume is the air content. ASTM test methods C231, C138 and C173 provide details of pressure, gravimetric, and volumetric procedures for determining the air content of freshly mixed concrete, respectively. First 24 to 72 hours after placing fresh concrete are of extreme importance. In this period, hydration of concrete occurs which is a chemical process in which concrete gain its strength. If temperature of concrete is not controlled and it goes beyond maximum range during hydration then stresses are produced and cracks are formed in concrete. Also if the temperature falls below the minimum temperature then concrete takes large time to set and hydration process slows down. It is necessary to understand here that concrete can be done in any temperature unless the temperature is controlled. When all the ingredients of concrete are mixed together, process of hydration starts and concrete begins to set. Setting time is important as it decides how concrete develops it strength. Reduced setting time results in concrete cracking and increased setting time affects durability of the concrete. Setting time is reduced if the weather is hot. As the concrete sets, the workability reduces and the concrete steadily becomes more difficult to place and consolidate. Also it develops cracks as high tensile stresses are produced due to increased process of hydration. 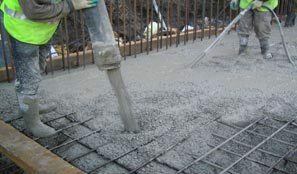 Concrete is therefore cured properly for 5 to 7 days till it has initially set (as shown in picture). Retarders (a type of concrete admixture) are also used to increase concrete setting time in hot weather. Setting time is increased if weather is cold as it slows down process of hydration. Large setting times affects strength and durability of concrete. Accelerators (a type of concrete admixture) are used to decreases concrete setting time in cold weather. It is important to control properties of fresh concrete before placing. These properties control many important parameters like strength and durability of concrete in long term.